AnyMP4 PDF Converter for Mac can help you convert PDF to document files such as Word, Text, Excel, EPUB, HTML and more, as well as various images like JPEG, PNG, GIF, TIFF and so on for Mac. 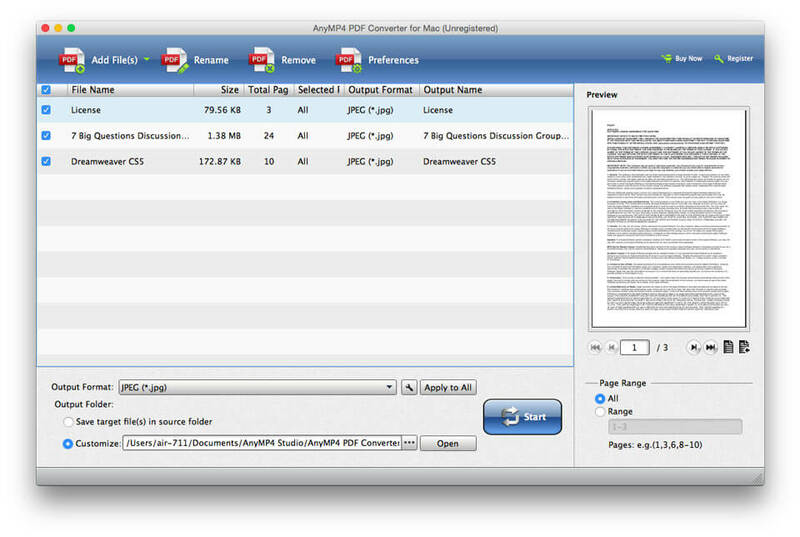 AnyMP4 PDF Converter for Mac can help you convert any PDF file to document format including Text, Microsoft Word 97-2003 (*.doc), Microsoft Word 2007 (*.docx), Rich Text Format (*.rtf), Microsoft Excel 97-2003 (*.xls) and more, as well as image formats like JPEG, PNG, GIF, BMP, TIFF and more. Besides, this software enables you to convert PDF files in any page range and preview the PDF file according to your needs. And you can save the target file(s) in source folder or customize output folder. In addition, it supports OCR technology to improve the effect of the output files.Key Functions:1. Convert PDF to any document format on MacThe Mac PDF Converter enables you to convert any PDF file to many different kinds of document formats like Microsoft Word 97-2003, Microsoft Excel 97-2003, Rich Text Format, EPUB, HTML and more on Mac. So you can read your PDF file without the help of PDF reader.2. Convert PDF to any image format for MacWith this PDF Converter Mac, you can convert your PDF file into JPEG, PNG, GIF, BMP, TIFF and other image formats for Mac. Besides, you can set the size and the color of the output images.3. Adopt OCR technologyThis PDF conversion software adopts OCR technology to improve the output file effect such as the accuracy, balance and speed. With the various language options, you can choose more language types by your own needs.4. Rename your PDFAnyMP4 PDF Converter for Mac can allows you rename your PDF with a unique name. So after converting your PDF, you can find it easily.5. Choose your needed page in your PDF fileThe PDF Converter for Mac software can allow you to choose the page range according to your need. You can convert the pages selectively. The unnecessary parts will not appear in your converted documents or images. For example, you want to convert page one to page nine, you can click “Range”, and then fill the blank with 1-9. A single, powerful product for all your printing needs! Print Designer GOLD allows you to create great looking Business Cards, Address and Shipping Labels, CD DVD Labels and Inserts, Envelopes, Post Cards, Name Badges, Signs and other media labels. Edraw Org Chart is a new organization chart drawing software, which creates organisation charts and business charts with minimum time loss for you. Support basic flowcharts, organizational charts, business charts, hr diagram and work flowchart. This software offers a solution to users who want to delete video files while they are playing. There are features to play next/previous video, delete current video to Recycle Bin so that you can sort and delete unwanted files right on the spot.